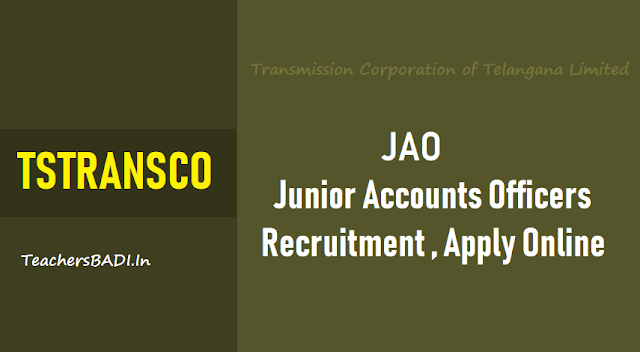 TSTRANSCO / Transmission Corporation of Telangana Limited Junior Accounts Officers(JAO) Recruitment/TSTRANSCO Transmission Corporation of Telangana Limited JAO Recruitment Online application form/TSTRANSCO Transmission Corporation of Telangana Limited Recruitment 2018/TSTRANSCO Transmission Corporation of Telangana Limited JAOs recruitment 2018, Results Merit List/ TSTRANSCO Transmission Corporation of Telangana Limited JAO Recruitment Hall tickets, Results 2018/ TSTRANSCO Transmission Corporation of Telangana Limited JAO Recruitment Results 2018 TSTRANSCO Transmission Corporation of Telangana Limited Junior Accounts Officers(JAO) Recruitment Selection list Results 2018: TSTRANSCO Transmission Corporation of Telangana Limited has releaseed the Junior Accounts Officers(JAO) Recruitment 2018 Notification and TSTRANSCO Transmission Corporation of Telangana Limited invites the #onlineapplications from the eligible and qualified candidates for the post of Junior Accounts Officers(JAO). TSTRANSCO JAO Junior Accounts Officers Certificates verification dates 2018: Certificates verification will be held on November 9 for Candidates, those who were passed the examination of JAO, JPO Recruitment and certification verification will be held on July 9, from 10 am for JAO Candidates and from 2 PM for JPO Candidates at Vidyut South. Officials have requested to take two Xerox set copies with attested by Gazeetted Officer and along with age certificate, Academic original certificates. TSTRANSCO Recruitment for 106 Junior Account Officer Vacancy : Transmission Corporation of Telangana Limited (TSTRANSCO) has issued a latest notification for the recruitment of 106 posts. The post name is Junior Account Officer. If you want to make career at TSTRANSCO Vacancy then you can apply online application from 27 August 2018 to 11 September 2018. It is golden opportunity for interested candidates, who are seeking government job in TSTRANSCO Vacancy. Further other details are given below.